The Fellowship was fortunate enough to obtain a copy of PROMETHEUS: LIFE AND DEATH #1 from Dark Horse Comics. The story is by Dan Abnett, with art by Andrea Mutti, colors by Rain Beredo, and lettering by Michael Heisler. Captain Paget and what’s left of her platoon of Colonial Marines are leaving LV-797 after investigating of possible claim jumping of the planet from a competitor to the Weyland-Yutani Corporation. While the marines suffered heavy losses, the possible gain is the spaceship they found. Paget grows concerned due to the lack of ship communications and her marines that are onboard. What she doesn’t know is that an Engineer has awakened, and is not interested in going to Ganymede Station. Honestly, I didn’t realize that this is chapter five of a seventeen part saga. This follows the recently concluded PREDATOR: LIFE AND DEATH miniseries. But that shouldn't deter you as there is a previously paragraph that gets you up to speed. I’m a big fan of Dan Abnett (who also wrote the PREDATOR book), so I'm sure things will be moving at a fast pace with the next issue. Mutti and Beredo did an awesome job with the art, I really like the look of the book. I’ll check out the rest of this series to see where things go. 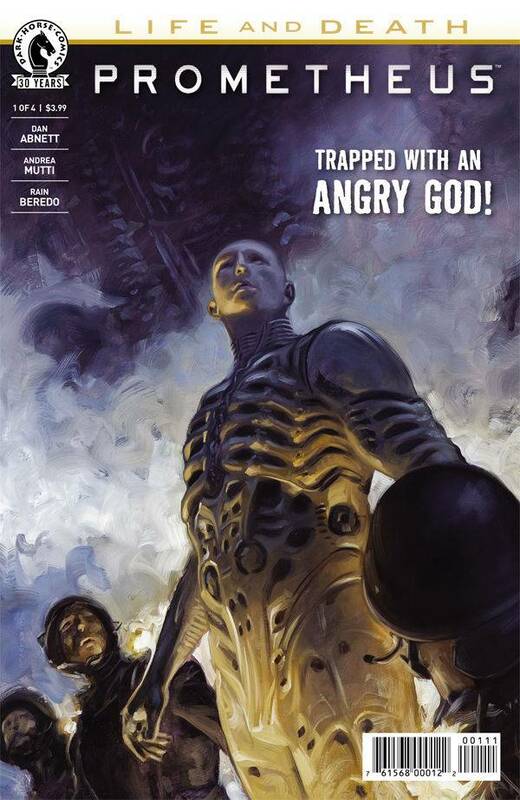 PROMETHEUS: LIFE AND DEATH #1 is in stores now, or available for ordering at www.DarkHorse.com.